​The ECG Distinguished Guest Lecture and supporting talks link fundamental chemical science with a current environmental issue. This year’s topic was plastic debris in the ocean. The meeting, which took place on 12 March 2014 at Burlington House, London, was organised by Stuart Wagland (ECG committee member) and jointly chaired by William Bloss and James Lymer (respectively, the retiring and incoming Chairs of the ECG committee). The meeting’s first speaker was polymer chemist Norman Billingham (Emeritus Professor, University of Sussex), who spoke on “Polymers and their environmental degradation” and declared himself tasked to “cover the whole of polymer chemistry in about forty minutes”. He began by reviewing the different types of polymers (thermoplastics versus thermosetting; amorphous versus semi-crystalline) and their production methods, noting that chemically identical polymers can be produced from monomer precursors derived both from fossil fuels and sustainable sources such as bioethanol. Thus the distinction between an environmentally costly and an environmentally friendly plastic is blurred. Next Professor Billingham tackled the degradation routes for plastics in the environment and sought particularly to address the fallacy that “all plastics that have ever been made are still with us today”. Any polymer will eventually degrade, but much depends on the conditions. Oxidation is the most likely degradation route in the environment, but most polymers today contain additives to stabilize them against oxidation. The long carbon chains of polyethylene are devoid of chemical functional groups and are particularly resistant to biodegradation by microorganisms, which typically initiate the breakdown of polymers by a combination of depolymerisation and enzymatic hydrolysis. It is, of course, possible to engineer plastics to be more amenable to biodegradation by, for example, incorporating hydrolysable ester linkages into the polymer chain. However, doing so typically compromises the physio-chemical properties of plastics that makes these materials so good at their job (mechanical strength, chemical stability, being impervious to gas and moisture). The key problem is that the very properties you want for biodegradability are the ones that you do not want in a durable packaging material. Indeed, the term “biodegradable” is itself somewhat misleading. Strictly, biodegradable packaging is required to meet European Standard EN13432, such that shredded plastic pieces degrade under industrial composting at temperatures above 50 °C. Such conditions do not occur in the environment. Not much is known on the specific question of how plastics degrade in seawater. It is reasonably well established that ultra-violet light and higher temperatures accelerate the degradation of plastics (the response is approximately linear with light intensity and exponential with temperature). The cooling effect of seawater is therefore likely to slow down degradation. Plastics that have sunk beneath the water, away from light and oxygen, are likely to be extremely long-lived. Edwin Foekema (Institute of Marine Resources and Ecosystem Studies, Netherlands) discussed the impacts of microplastics on marine life in his talk “Aspects that determine the actual risk of plastic associated POPs for marine organisms.” Persistent organic pollutants (POPs) such as polychlorinated biphenyls (PCBs), polybrominated diphenyl ethers (PBDEs), dioxins and DDT are highly toxic and/or carcinogenic. POPs are only sparingly soluble in water, but readily dissolve in plastics, such that trace amounts in seawater concentrate in plastic debris in the ocean. When ingested by aquatic life, POPs migrate to lipid environments such as the tissues of the organisms. A Japanese study has shown that plastic fragments collected from beaches around the world contained varying but consistently elevated concentrations of POPs [Ogata et al., Marine Pollution Bulletin, 58, 1437, (2009)]. If the plastic pieces are sufficiently small, they can be ingested by indiscriminate eaters like lugworms that provide food for species further up the food chain, including fish species that we humans enjoy eating. Inside the lugworm’s gut, phase equilibria re-partition the POPs between the plastic and the organism’s tissues (the lipid phase), wherein they bio-accumulate. The problem is not that the plastic particles are intrinsically harmful to marine organisms (although chemical components that leach out of the plastic can be), but rather that the particles provide an efficient mechanism through which harmful POPs are pre-concentrated and transported into the organism. Heather Leslie (Vrije Universiteit, Amsterdam, Netherlands) began her talk on “Macroplastics and microplastics – what is their environmental impact?” with an overview of the different size fractions of plastic litter in the oceans. Macroplastics comprise the large pieces of packaging, drinks bottles, fishing nets and ropes commonly seen washed up on the shoreline. Whether by chemical degradation, biodegradation or the mechanical action of the sea, macroplastics are broken down into smaller pieces. These fragments are re-categorised as microplastics once the particle sizes become smaller than about 5 mm (awkwardly, different research groups adopt different sizing conventions, which is a significant issue hindering comparisons between observational datasets). There is no minimum size limit to microplastics; particles have been found down to a diameter of 1 휇m, and Heather expects there to be even smaller particles (as yet undetectable) circulating in the environment. Large macroplastic items, she argued, are “only young microplastics” since the former will inevitably be reduced to the latter. Plastic litter in the ocean is part of a very dynamic system. Ocean currents move plastics around the globe: for example, debris washed into the sea by the tsunami that struck Japan on 11th March 2011 began to wash up on the west coast of the United States in Spring 2013 – see http://marinedebris.noaa.gov/tsunamidebris/faqs.html. Whilst at sea, plastics might degrade, sink, degrade further, re-float, be colonised by biota (which might also sink the plastic or, by covering its surface, protect it from degradation); all of these processes repeat many times. Meanwhile, residual monomers or chemical components added during manufacture to give plastics their desirable properties (plasticisers, UV stabilisers, pigments, flame retardants) are slowly released into the environment. A handful of studies have identified specific toxic effects in marine species that have come into contact with microplastic debris. However, because “every plastic degrades with its own personality”, the toxic effects remain largely unknown as plastics degrade and move through the environment. The consensus opinion is that microplastics are “sub-toxic” since, although microplastic particles are liable to impair the functioning of an organism that has ingested them, the organism itself probably will not die. That said, the effects of microplastics are endemic because many other individuals from the same population will also have come into contact with, and probably also ingested, similar plastic particles. If, however, a large marine organism becomes entangled with a piece of macroplastic debris, it is likely to be fatal. This is obviously very unfortunate for the individual creature, but the rest of the population is not harmed. The EU-funded FP7 CleanSea project is developing a roadmap to “good environmental status” for marine litter by 2020. The project aims to identify the sources and drivers of marine litter, improve monitoring tools, standardise the many ways in which observations of marine plastics are currently reported, and establish best practices, management measures and policy options. See www.cleansea-project.eu. The 2014 Distinguished Guest Lecture “Plastic debris in the ocean – solutions to a global environmental problem” was given by Richard Thompson (Plymouth University), whose laboratory was one of the first to study marine plastic litter. Professor Thompson’s particular interest in plastics began whilst volunteering to clean beaches of man-made debris. Although fishing crates, netting, tyres and other large plastic items washed up on the shoreline were easy to identify, collect and remove, the abundant smaller pieces of debris were often ignored. Seeing the challenge, Professor Thompson asked his students to find the smallest piece of plastic debris on a beach. They collected sand samples, examined them under a microscope and immediately saw brightly-coloured particles, some of which were smaller than the surrounding sand grains. These particles were subsequently identified as microscopic fragments of plastic: Professor Thompson coined the term “microplastics” in 2004 to describe them. Some microplastics are emitted directly into the environment: for example, fragments of man-made fibres produced by washing clothes and polyethylene microbeads added to some shower gels are small enough to slip through the filters at sewage treatment plants. The rest derives from the breakdown of larger pieces of plastic. The burden of macroplastic items already floating in the ocean is such that, even if we could stop adding to the debris today, we would still face a legacy of many years of microplastic contamination. A wide-ranging study published by Professor Thompson’s research group found microplastics in the inter-tidal sediments at every one of 18 sampling sites “representing six continents from the poles to the equator” [Browne et al., Environmental Science and Technology, 45, 9175, (2011)], suggesting that microplastic contamination is ubiquitous. The interaction of marine organisms with microplastics therefore occurs at the population level, and Professor Thompson’s review of the various marine species found to have ingested plastics and their largely unknown toxicological effects echoed many of the points raised earlier by Dr Foekema and Dr Leslie. Marine plastic litter has adverse economic and societal effects too. RNLI lifeboats are called out hundreds of times each year to assist mariners whose boats’ propellers have become fouled by fishing ropes; holiday destinations spend money to keep their beaches pristine and attractive to the tourist trade. Professor Thompson is seeking to persuade fishermen to bring back to shore items of plastic debris they find at sea; readily accessible disposal facilities on the quayside encourage this effort and reduce any temptation to jettison unwanted/broken items at sea. These efforts have the added benefit of raising awareness amongst fishermen about how they engage with their environment. More widely, it is also important to generate public engagement. For example, images of large marine animals – a dead turtle entangled in a discarded fishing net or a seal struggling with a mooring rope around its neck – employ a shock factor that can be used to challenge the public to consider their role in limiting plastic debris. Professor Thompson himself advocates the use of plastics, firmly believing that their value in transport, food preservation, electronic devices (the internet would be impossible without plastics), electricity transmission and renewable energy applications reduce our carbon footprint relative to the non-plastic alternatives. And as Professor Billingham opined in his opening talk, the chemist’s greatest contribution to human health was the invention of plastics to construct clean water pipes and sewer pipes. As a society, we do, however, need to change the way we engage with plastics. For 50+ years we have been “trained” to view plastics as single use items; this is particularly true of plastic packaging material. Nowadays, there are opportunities to recycle (some) plastics, but product designers need to do much more to develop packaging that, in addition to looking attractive on the supermarket shelf, facilitates recycling after use. More also needs to be done to improve waste management facilities in developing countries to prevent plastics entering the environment because, once in the ocean, plastics debris from just one country may wash up on shorelines all over the world. UN Sustainable Development Goals will include "eliminating the pollution and dumping of toxic materials in water bodies, and protecting aquifers", which may help to guide governance of this problem – see http://sustainabledevelopment.un.org/focussdgs.html. For Professor Thompson, the bottom line is that plastic debris is entering the oceans faster than we can possibly hope to remove it. The only solution, therefore, is to limit the emission sources of plastics into the environment through a combination of education, infrastructure changes and more intelligent designs for plastic items that address their full production/use/reuse life cycles. The ECG acknowledges funding for this event from the RSC’s Environment Sustainability and Energy Division (ESED). 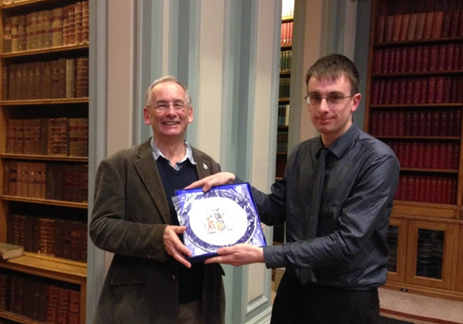 The presentation to Dr Leo Salter (left) by the current chair of the ECG, James Lymer (right), during the 2014 ECG AGM. Photographed at the Chemistry Centre, Burlington House. The authors are both committee members of the ECG.